Go Wish: A thought-provoking activity for all involved. Many of us think we know how we want to live our lives. But how many have sat down and discussed how we’d like our lives to end? Go Wish gives you an easy, even entertaining way to talk about what is most important to you. The cards help you find words to talk about what is important if you were to be living a life that may be shortened by serious illness. Playing the game with your relatives or best friends can help you learn how you can best comfort your loved ones when they need you most. Each deck has 36 cards. Thirty-five of the cards describe things that people often say are important when they are very sick or dying. The cards describe how people want to be treated, who they want near them, and what matters to them. One card is a ‘wild card.’ You can use this card to stand for something you want that isn’t on any of the other cards. This past November, Pallium India-USA met to try out using this important tool. We wanted to find out about our own end of life plans and questions, as well as to discover the best ways to serve the community as hospice volunteers and advisers on end of life planning. Ms Cindy Safe, Executive Director of the Coda Alliance, a community-based, not-for-profit organization that helps individuals and their families plan and prepare for the concluding passages of life led the activity. It took place at member Saroj Pathak’s house in Los Altos Hills, CA. Very interesting discussions followed. For the participants, who are involved in the field as Pallium India-USA volunteers, and for many of us, also as healthcare professionals, it was an eye-opening experience. We were surprised to learn, for example, how a phrase like “maintain my dignity” held different meanings for different people. 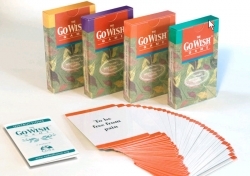 A worthwhile activity, and we highly recommend Ms Safe and the Go Wish game to anyone as a way to begin opening up and talking about this important topic.